BETTEANTISLIP provides even more stability while showering. 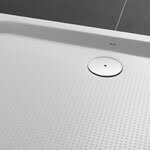 A quartz sand mix can be fired onto all our enamelled baths and shower trays, combining safety with haptics. The optical effect and colourfullness are also conserved. White baths get a white finish. For the coloured shower areas there is the transparant BETTEANTISLIP. 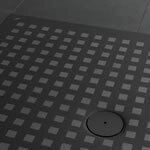 In connection with our special surface BETTEANTISLIP fits our 3.5 cm shallow shower trays with dimensions 120 x 120 cm und 150 x 150 cm, and BETTEFLOOR fulfills the requirements of E-DIN 18030 2006.